Over the last few weeks, I’ve been reading a great book on the Pareto Principle called The 80/20 Principle, The Secret to Achieving More with Less by Richard Koch. I ended up purchasing this book on the recommendation of Tim Ferriss, author of The 4-Hour Work-week. Tim is a big fan of the book because he has successfully applied the 80/20 principle to just about every part of his life. This week in a 3-part series, I’m going to blog on the use of the principles laid out in this book to maximize our effectiveness in living the rich Christian life. There is a consistent mathematical relationship between the proportion of people and the amount of wealth this group enjoyed. In simple terms, if 20% of the people retained 80% of a nation’s wealth, then you could reliably predict that 10% would enjoy 65% and the top 5% would have 50%. The key to his discovery was not the percentages, but that the distribution of wealth across the population was predictably unbalanced. This pattern of imbalance was repeated consistently whenever he looked at the data for different historical time periods or other countries. The same pattern repeats its self with mathematical precision over and over again no matter the time or place. Although Pareto had uncovered a significant discovery, he was terrible at explaining his findings, and the importance of the principle lay dormant until after World War II. At this point, others such as George Zipf, Joseph Moses Juran, and the IBM company began utilizing the 80/20 principle in the area of business operations. Today, Pareto’s Principle is commonly known, taught, and practiced around the world. We expect all causes to have an equal amount of significance – every customer is important, every product produced is as significant as the other, every relationship we engage in, and every minute of each day is of the exact same importance. Even though this idea of equality and “fairness” seems logical, the math and real life experience tells us otherwise. 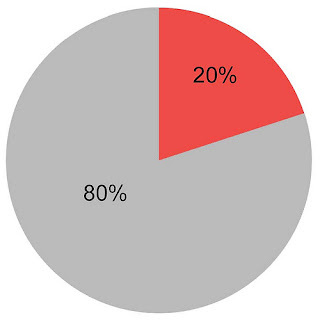 In business, 20% of customer base generates 80% of revenue and 20% of products produce 80% of the bottom line. Instead of fighting against this imbalance, we need to work with the imbalance, placing more time, energy, and action into the most profitable 20% of anything we do and less in the bottom 80%. In my next post, we will look at real life application of the 80/20 principle into our daily lives: our time, our relationships, and our work.